My video-game-playing activity is like a roller coaster. There’s peaks and valleys. I’ll go months without really playing any games at all; just pouring everything into my work. And then a switch flips and NOPE I’MMA REPLAY EVERY MASS EFFECT NOW. This pattern has been repeating for a few years now. 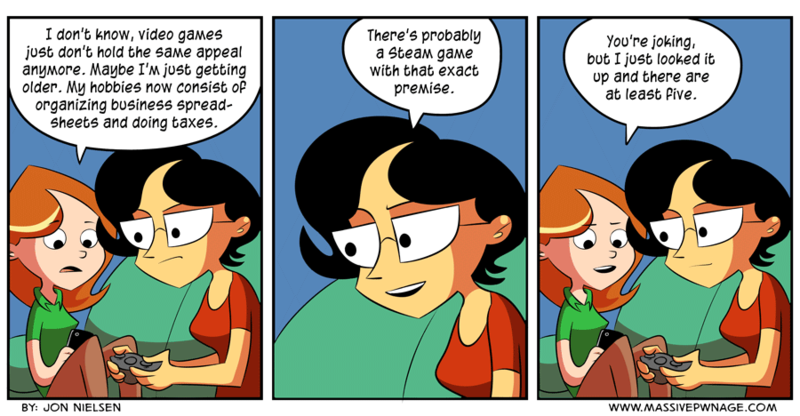 This entry was posted on Monday, July 7th, 2014 at 12:00 am and is filed under Comics. You can follow any responses to this entry through the RSS 2.0 feed. Both comments and pings are currently closed. LOL. I’m still in a twice weekly WoW raiding guild, but outside of that, I know what you mean. Those Mass Effect/other-long-franchise marathons sure are fun, though. I’d join you, race you even, in that ME-athon, but for the mineral gathering parts.